1. There are more speed grade (8 grades), reasonable speed range, with low speed but high torque. 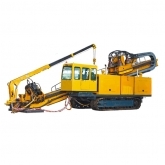 The rig is adapted for core drilling with tongalley-carbid-tipped and diamond bit, as well as suitable for engineering geological exploration, hydrological well drilling and basic pile engineering. 2. With large spindle I.D. 93mm (3.66 inch), the rig is fed with hydraulic double cylinders with much longer stroke up to 500mm(19.69 inch).With strong technological adaptability, the rig can be adapted on many field, especially on large diameter drill rod drilling, with wire line coring (upper part coring). Thus it is more effective in improving drilling efficiency with less faulty in hole. 3. With powerful drilling capacity, the rated drilling depth comes up to 1,300m(4,264 feet) with 71mm(2.80inch) drill rod with wire line coring. 4. Light in weight, the rig can be dismantled into 10 parts easily (the biggest one 450kg equivalent to 992 lb). The rig weighs 3,100 kg(6836 lb) (without power unit). It can be moved easily especially in mountain area. 7. Supplying oil with a single-gear pump, it is easy for installation and application; lower in consumption of energy and a low temperature of hydraulic system oil; the rig is for sure in steady drilling. The hand oil pump may be used to hoist the drilling tools in hole upon the faulty of power engine. 8. Compact in structure and reasonable layout, and all exposed outside, non overlapped components, it is easier for maintenance and repair. 9. Low center of gravity and long travelling distance up to 460mm (18.11 inch), the rig is reliable and stable in high speed drilling.